There are indexes and there are indexes. Some link to images of actual documents. Some tell you where to find the actual document without linking to it. When I find an ancestor in an index that's not connected to an image of a document, I print the indexed results and then try to obtain a copy of the document. When I search one of these records I get results that look similar to the ones in the photo, above, and those below. 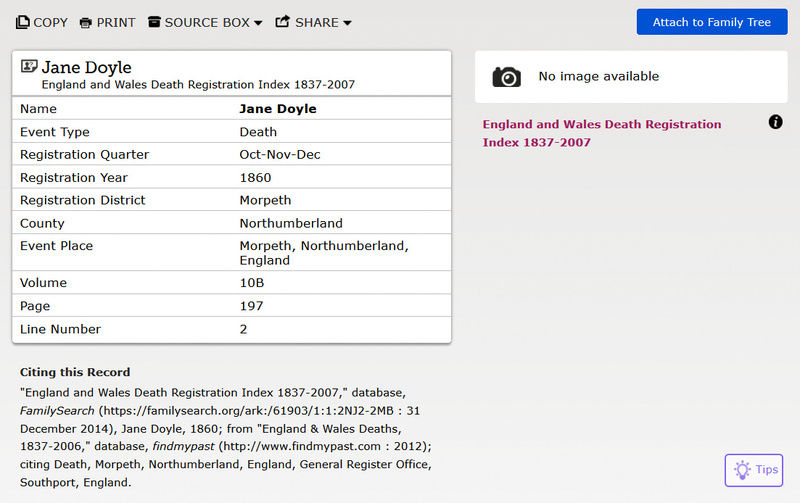 In this instance I searched for Jane Doyle, location of death as Northumberland, date of death between 1850 and 1865. There are four individuals named Jane Doyle in the results, all meeting the criteria I requested. Any of them could be (or could not be) the person I'm trying to find. When I click on one of them I'm taken to a screen that looks like this one, below. The only information in this record is name; quarter of death; location of death; and the reference to the actual source document in the U.K. GRO Index. This is not an image of the actual document and does not give enough information to determine whether this is the ancestor I'm seeking. No family members are named nor is any other specific information given. You'll notice that FamilySearch gives a citation for this record and offers me the opportunity to attach it to an individual in Family Tree. But this is only an index result, not a document that helps me know whether this is my ancestor or not. Until I order the document there is not enough information to tell whether this may be my ancestor or not. I do not want to save this record to an individual in FamilySearch's Family Tree, order the record, and find out it isn't for the person I thought. I'd rather wait until I know for sure, then attach this as a record along with a transcription of the document. Find a copy of the original document. Record the information in your personal genealogy program. Include a source citation and a transcription of the record in your genealogy program. I love indexes but if I assume a person I find in an index is my ancestor without actually seeing the document I could go far astray. An indexed record is not the same as a source document. How about you? Do you cite the results of index searches as documents? I do the same as you, Nancy. I only ever attach the index to the individual(s) in my Ancestry tree, when I've seen the record itself and am sure it's the right one. I think that makes so much sense, Dara. It's saves extra work, too: if we added the index before knowing for sure it was the ancestor in question we'd just have to undo it if it turned out to be the wrong person. While I agree that this is not absolute proof, I do attach these to my tree, though it's private, so I don't risk messing anyone up. I THEN include a note about my certainty level of the information and the need for more research. Sometimes an indexed record is all we'll get. But I agree, for people new to genealogy research, it's important they understand that an index result is NOT a record nor proof of a fact. Teresa, if you add the indexed information as a source and you then, after obtaining the document, find out it's not your ancestor, do you remove the indexed information? Just wondering how others handle this. Thanks. There is so much using of others trees.... even if it is only a "maybe" it goes on and on and on. I have been at this one year and was horrified at all the wrong information on my meager family. I am now resigned but will not contribute to possible wrong information.... it just goes on and on and on. I haven't used other people's trees and rarely look at them I guess because I've heard that there's so much inaccuracy in them. Documentation is so important, along with quality sources and careful evaluation. Very good point, Nancy! With my husband's many, many WOOD ancestors, it's not possible to determine, simply from an index, whether the person mentioned in the record really is the ancestor I'm researching. Eyes on the document itself will tell the tale. Thank you, Marian. With a name as common as Wood, it would be essential to see the document (and even then I suppose there could be some uncertainty).